Since the closure of Highway 99 through Seattle on Jan. 11, commute times have been slightly above average — but have fallen far short of the most dire predictions. Mostly, it seems from the limited preliminary data that’s available, people are heeding the warnings and pleadings of transportation planners and changing their commutes or simply staying home. Travel speeds during peak rush hour didn’t get much worse, but peak rush hour has been lasting longer — starting earlier and ending later. Washington State Ferries — which does have up-to-date ridership data — offers an illustrative example. Through the first 11 days of the viaduct closure, car traffic on the route between Seattle and Bainbridge Island was down 15 percent from the same period last year. But that doesn’t mean people are ditching their cars in favor of a public-transit commute. Foot traffic on the Seattle-Bainbridge route is also down from last year, albeit by a more modest 3.5 percent. Likewise, on the Seattle-to-Bremerton route, car traffic is down 5 percent, while foot traffic is down about 1.5 percent. A small portion of that disappeared ferry traffic may have gone to the Kingston-to-Edmonds route, which has seen slightly increased traffic. 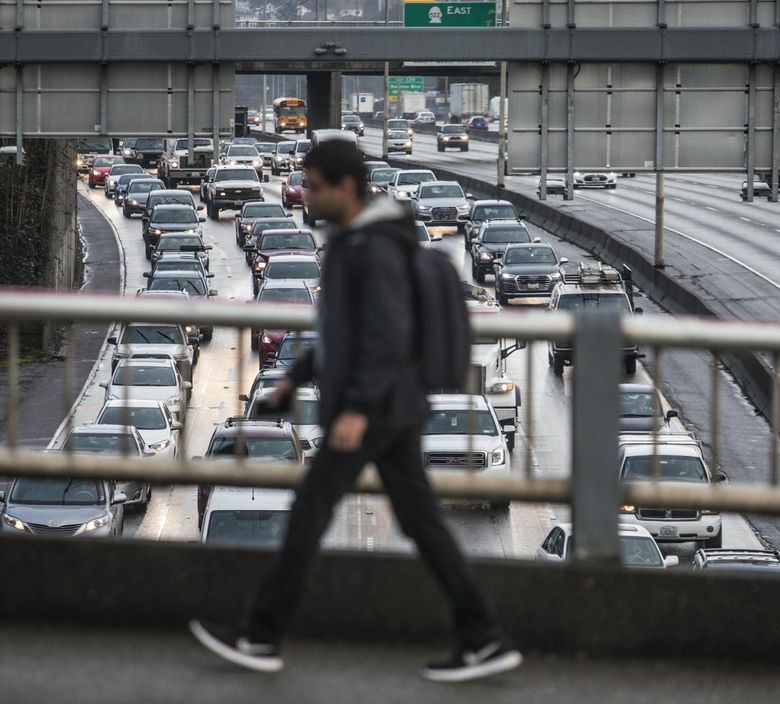 Traffic volumes on highways across the region decreased about 1 to 6 percent during the first week of the viaduct closure, according to the Washington State Department of Transportation (WSDOT). The only place on Seattle-area highways where traffic volumes were higher than normal every day last week was on I-5, just north of the intersection with I-90. I-5, at Yesler Way, carried around 279,000 cars a day on an average weekday last fall, according to WSDOT traffic counters. Last week, it carried nearly 294,000 cars a day. Far more typical of regional highways, however, is I-405, in Kirkland, which normally carries about 182,000 cars a day past the Kingsgate Park and Ride. Last week it averaged about 181,000 cars a day. Or the I-90 bridge, which normally carries about 156,000 cars a day, but last week averaged about 152,000. Two places where we know, for sure, that a few of those 90,000 drivers a day are going is onto bicycles and onto the West Seattle water taxi. Bike counts at the city’s major bike thoroughfares were way up last week. During the first five days of the closure, daily ridership on the Spokane Street bridge, connecting West Seattle to the rest of the city, more than doubled from the same period last year, according to Seattle Department of Transportation data. On the Fremont Bridge, daily ridership increased 40 percent. But in terms of raw numbers, those increases represent an additional 1,400 or so bike trips on both routes combined — a big number, but not 90,000. Water-taxi ridership more than tripled from the same period last year. In raw numbers that meant about 1,600 more riders a day, again, a lot of people but not 90,000. The big unanswered question remains: How many more people are riding buses and trains than usual? Sound Transit is seeing “slightly higher than normal” ridership on both light rail and commuter rail, spokesman Geoff Patrick said, although the agency won’t have preliminary numbers for two more weeks and won’t have a full picture until March. King County Metro added an extra 20 “standby” buses to the busy routes serving Aurora Avenue and West Seattle. Those added buses carried nearly 20,000 riders total in the first eight days of the shutdown. But the agency doesn’t yet have an estimate for how many people its full fleet of more than 1,500 buses is carrying during the closure, or how that compares to normal. The counterintuitive idea that removing a major highway needn’t necessarily cause a traffic disaster is long-studied. In 1968, German mathematician Dietrich Braess presented Braess’ Paradox, which showed that in a congested transportation system adding a new travel route can increase travel times. Burfeind pointed to studies showing that increasing highway capacity leads to more driving and, often, more traffic. About 60 years ago, urbanist and activist Jane Jacobs coined the term “attrition of automobiles” to describe a similar phenomenon. When a modest road through Washington Square Park in New York City closed down in 1958, transportation planners predicted traffic disaster for the neighborhood.